He’s everywhere on the Eastside. On cars, candles, soaps, and even T-shirts. Seems as though that good old-fashioned, pagan-as-it-is, Mexican Catholicism isn’t enough. The introduction of new ‘idols’ need be introduced like Jesús Malverde, who is the saint of a rather shady group of folks. This entry was posted in culture, Eastside and tagged Eastside, jesús malverde, la santísima muerte by Julio. Bookmark the permalink. Great minds think alike! 🙂 I’m finishing up a post on Santa Muerte tonight. …and SCREW Disneyland. I want to go to Tepito! I BELIVE IN THE SANT MUERTE. SHE HAS DONE SO MANY MIRICLES FOR ME AND ALL MY FAMILY BEGAN TO BELIVE IN HER. CAN I GET MORE INFO ABOUT YOUR CHURCH. THANKS FOR HAVING THIS PAGE. Don’t believe anyone who wants to keep you from believing in la santisima muerte. Those are people who don’t want to see you happy. Viva la santisima muerte! I was introduced to the sacred lady by a girl i was dating,became fascinated. I paint her with love in my heart chanelled towards her. I do not doubt,or question if she is “real”- that is an immaterial question. This is not black magic- this is love. 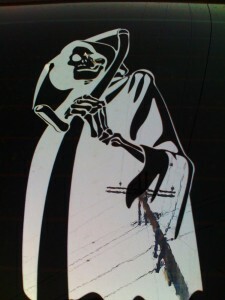 I love santa muerte she’s given me the courage to move onn&$=!!!!! !